An epic clash of comedians where YOU decide the winner! 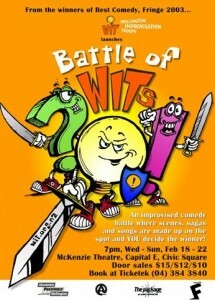 Battle of WITs is the all-new improvised comedy show from the Wellington Improvisation Troupe (WIT). Scenes, songs and stories are made up on the spot by Wellington’s leading improvisers and gutsy newcomers alike, armed only with their wits! Split randomly into teams throughout the night, players must work together in order to sway the audience, whose vote, after each round, determines who gets to live on… or fall on the sword of death! “The showdown in the final round has been known in the past to cause more than it’s fair share of heart failure amongst our audience”, explains Wilson. Never…will so many…die laughing…at so little. 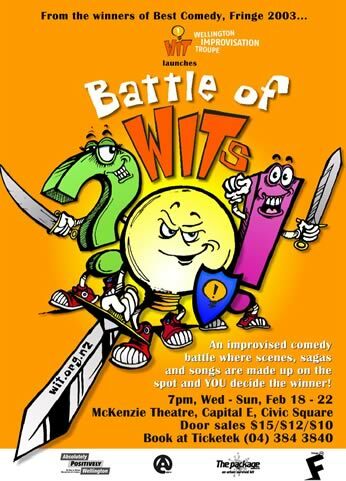 This entry was posted in Other formats, past shows and tagged Battle of WITS, BOW, Fringe, improv, improvisation on February 18, 2004 by MaDmin.